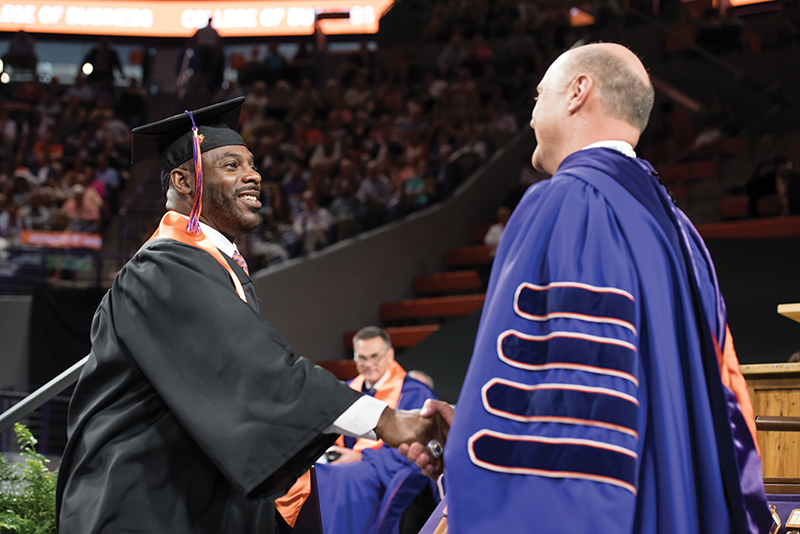 More than 4,700 Clemson graduates walked across the stage in December and May of this past academic year in a commencement tradition that never gets old. I love looking into the eyes of our new graduates wondering how they will use the amazing foundation their Clemson education has provided. With each hand that I shake on stage, I grow more assured of our graduates’ abilities to achieve their dreams and make a positive difference in the world. Our students come to Clemson as undergraduates having already set themselves apart from many of their peers in the classroom. Indeed, the average SAT and ACT scores for our applicants last year place Clemson among the very best in public higher education for student quality. Students are coming to Clemson with better academic credentials, and the pull of the Clemson name has never been stronger among potential applicants. This year we received more than 26,000 applications for 3,600 spots. That’s a 41 percent increase in applications from just five years ago. Clemson’s popularity has been broad-based. Not only are we doing a better job of attracting elite students from outside South Carolina, Clemson today is educating 3,000 more high-quality in-state students than we did 10 years ago. The continuously improving academic profile of our accepted students is a reflection of Clemson’s status as a top-tier public research institution as well as our much-deserved reputation for creating a living and learning environment that is second to none. The students who are choosing to come here are doing so because of our reputation, academic programs, research, real-world learning opportunities and return on investment. They also are attending because of the family-first atmosphere and strong sense of community at Clemson — all of which are reflected in the wide spectrum of national recognition Clemson receives each year. This year, the University was ranked No. 23 among national public universities by U.S. News & World Report. And we just learned that we have been named the top university for career services and ranked in the top 10 in seven other categories in the Princeton Review’s annual national survey of more than 130,000 college students. Our ClemsonForward strategic plan articulates our strong commitment to undergraduate teaching and individual student success. And once enrolled, our students continue their paths toward great achievements in an environment that is built to foster their growth and to surround them with family that applauds their successes. This past academic year was a record-setting year for the number of students receiving nationally competitive scholarships or fellowships. In total, 28 students received national honors: four Fulbright Grant winners; two Goldwater Scholarship recipients; eight National Science Foundation Graduate Research Fellowship recipients; 12 Gilman Scholarship winners; one Schwarzman Scholarship recipient; and one Truman Scholarship recipient. Clemson has a long tradition of offering a world-class undergraduate education to the best and brightest students from South Carolina, across the country and throughout the world. We remain committed to providing the resources and strategic direction necessary to build on our legacy as a “high seminary of learning” so that future generations of students will walk across our commencement stage confident in the knowledge that their Clemson education has prepared them for a lifetime of success. Yes it’s great to get your degree, but what the world doesn’t prepare you for is the political influence and that alone questions the validity of the degree. The reason I’m so passionate is because I am experiencing this as I speak.